Over at Bat in the Attic, +Rob Conley thought about using the D&D5 Advantaged/Disadvantaged mechanic in GURPS, or for 3d6 rolls. Basically, roll extra d6s, and pick the lowest three. I’ve written about the D&D mechanic before. More than once. This has the beneficial aspects you’d find in D&D, in that it keeps the die roll in the usual space, but alters the probability of a given result for the better. 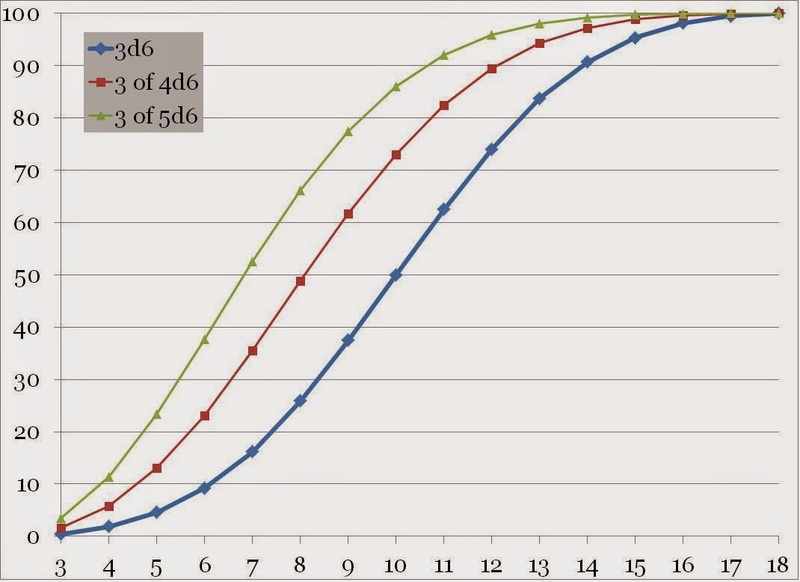 As you can see, in the heart of the curve, you get the equivalent of a +2 bonus (or -2 to the die roll) for 4d6 drop the highest, and +3 for 5d6 drop the two highest. This scenario only works when you really, really want to not modify the roll. GURPS is so modifier-heavy for most things that I’m not sure this mechanic is the right fit, though it’s worth thinking about when you would want to do this. One area that would be interesting would be in (for example) a hit location chart, where you might use this (or 4/5d6 drop the lowest) to deal with locations struck from an elevated or prone position. Where else would this apply? Next Next post: An exploding damage die for GURPS? I don't like it much. I'd rather just have the +3. Extra dice are for damage rolls, not for skill rolls. My biggest complaint about this mechanic, and it's really the whole notion of Advantage/Disadvantage, is that it flies in the face of the granularity for which GURPS is famous. Even in D&D5 it's a distraction for me – it's worth roughly a +/- 2, but what about those situations where a -1 or a +4 is warranted? +Jason Packer Advantage/Disadvantage is meant to be a good enough mechanic in D&D 5e. For the player it is clearly a better (or worse) roll than a straight 3d6. For the referee he only has to decide whether what the player did resulted in one of three choices, advantage, a disadvantage, or neutral. And because the result is still a total of 3 d6s you can combine it with the modifiers you do want. Or you can just revert to modifier in the situations you care about. It is definitely not meant to capture the nuances of the modifiers of the various GURPS subsystems. I am sure there are times when even the most detail oriented GURPS referee feel the player has done something advantageous or disadvantageous but doesn't want to figure out an exact modifier. This can serve as a tool for those times. I think this is a great optional mechanic for people who run ultra light or other stripped down versions of GURPS. And, related to Jason's statement about flying against granularity, I believe it can actually be used to add granularity back in, without having to deal too much with multipliers. A character with Guns! or Fighting!, but Advantaged in revolvers or axes, for example. A more insidious and continuous version of Luck? An alternative means of representing extra time being spent (more time means more dice added, where you only take the lowest three…)? A way of representing 'keen'ing in skill or weapon enchant, ie – you roll more die and then take the lowest (or highest, predetermined) three when rolling on the critical hit chart. It would make the curve *slightly* favour more "interesting" and powerful outcomes, whilst not eliminating the full spread of options or allowing the PC to bias a choice (which would happen if you rolled twice and picked the "best", as the "best" is often subjective to the situation at hand).